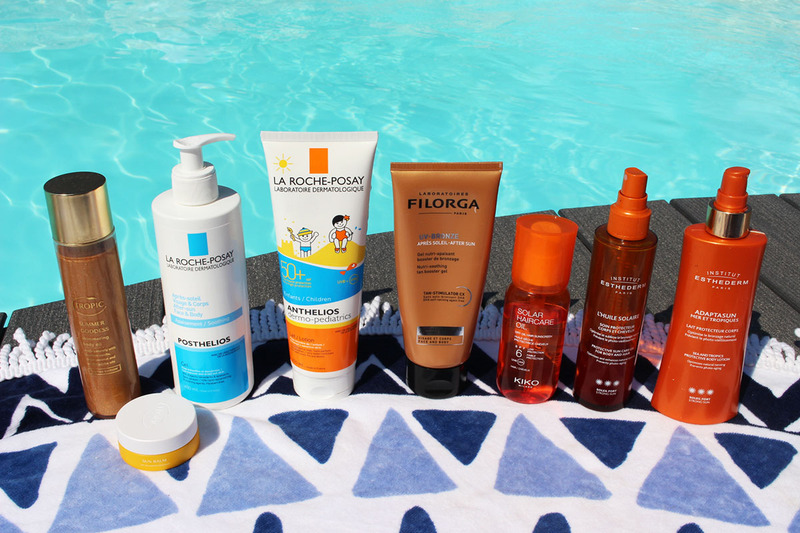 I was planning to blog about all my holiday must haves before or during our Summer break in France, but I was super busy packing and then I enjoyed myself soooo much at the villa, that I didn't even open my laptop. Best holiday ever! Now I am back, let me tell you what I packed with me, as many of you are probably going on holiday in August/September. 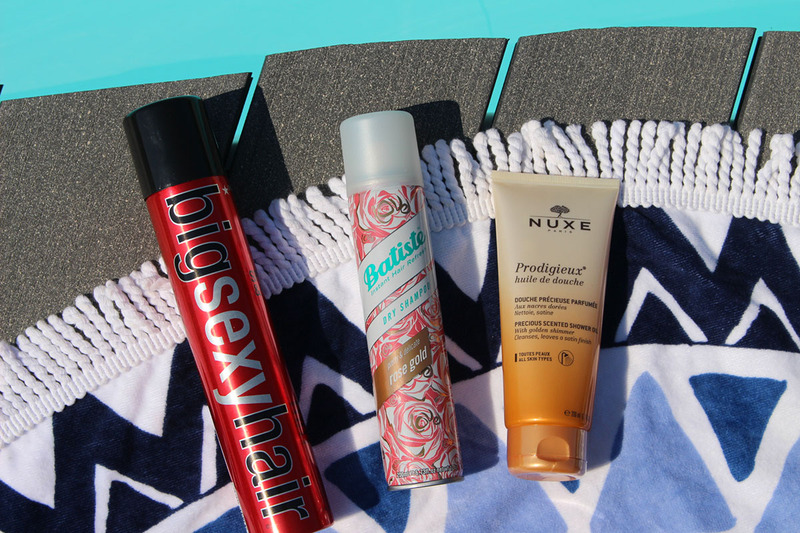 Let's start with the most important part - suncare! I never burn my skin, even if I forget sunscreen, but my husband burns soooo fast and the kids need protection too, so I packed loads of products! The La Roche-Posay Anthelios Dermo Pediatrics SPF 50+ lotion*(£20.50, 250ml) was perfect for all of us and suited Scott's sensitive skin really well. I never buy cheap sunscreen, as it's known for causing allergies and even burns, so this is my new favourite for the family. I also opted for the Posthelios Reparative Concentrated Gel Care After Sun*(£18.70, 200ml) from La Roche-Posay and it's amazing! My poor hubby managed to burn parts of his body (as he forgot to reapply suncream) and this light, ultra hydrating and nourishing formula helped to soothe and repair his skin. I used it every single day in the evening on myself and on the kids too and it will be my go to from now on! I ordered both of these from Notino. 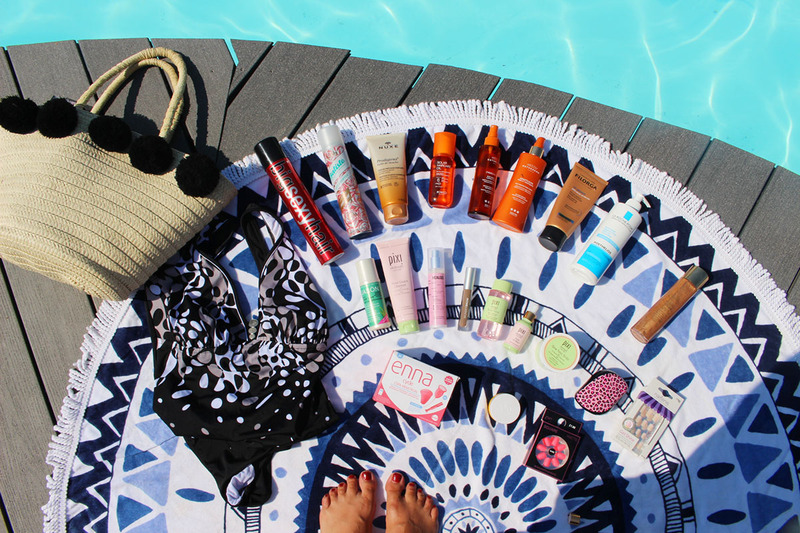 I packed some Sun Balm*(£16.00) from Tropic Skincare as well (I use it on my face) and their Shimmering Oil*(£28.00) for my body - I love a bit of sparkle to go with a tan! Looks stunning and keeps the skin soft! I also used the Filorga After Sun*(£25.00, 200ml) every day and oh my... it's a real treat for the skin. A light gel texture to comfort the skin after sun exposure, whilst maximising the tan with long-lasting results. I adore it! For my hair, I packed the KIKO Solar Hair Care Oil, which is not available anymore, but there is so many options out there. I made sure to spray it to my newly bleached hair to prevent further damage. I couldn't leave without my all time favourites from Institut Esthederm and their Adaptasun range. The Suncare Oil for Strong Sun*(£43.00, 150ml) offers protection from the harmful effects of the sun (UVA and UVB light, oxidation, UV-induced inflammation and DNA damage), but also helps to develop a golden tan and maintain the skin's youthful appearance in normal to strong sun – for a deeper, safer tan and for well-nourished, enhanced skin results. The Adaptasun Protective Tanning Care Body Lotion for Strong Sun*(£44.50, 200ml) is also a must have for me. It protects skin from UVB and UVA rays, and helps the skin adapt more quickly to the sun for a deeper, stimulated and long-lasting tan. It is suitable for normal skin that tans easily and rarely burns, which is ideal for me. I got so many comments on my golden tan and this is my secret. I am not gonna lie, my skin looks so beautiful! Next, I have a few fashion bits to show you. First one is the straw bag with pom poms, which I got from Home bargains for £5! Yep, a fiver! It's an absolute bargain and perfect for the Summer. I also took some false nails with me. A cute french manicure style by Nailene*(£7.99) and bright neon pink ones from Primark! The swimsuit is a stunning piece from www.ukswimwear.com and I absolutely love the design. It's the Bahama Flow Swimsuit*(£94.95) and I got mine in a size 22. It's super flattering and the cut is perfect with a plunge neckline and a low back. It features a cappuccino style colour scheme of abstract blotches in a black background, an enamel brooch in the middle and an elasticated soft cupped bra for comfort. I feel like a goddess when I wear it! 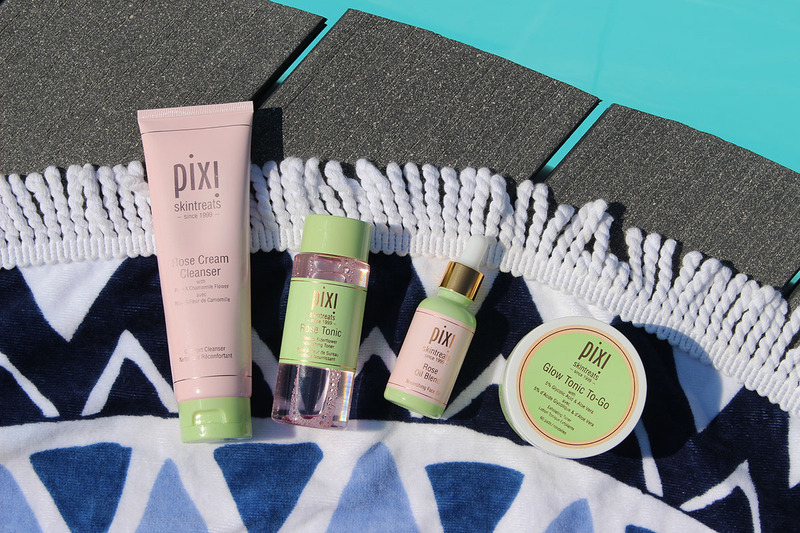 When it comes to skincare, I went for a few new additions from Pixi Beauty to keep my skin happy: Rose Cream Cleanser (£18.00), Rose Tonic*(£10.00), Rose Oil Blend*(£26.00) and Glow Tonic To Go*(£20.00). I received these in a goodie bag at a Pixi dinner recently and I am obsessed. The perfect combo for soft, supple and nourished skin. And the rose scent is so beautiful! As I was expecting a period mid holiday, I also packed a new menstrual cup with me (two actually, as I just popped the full box into my suitcase, as I wanted to photograph it). 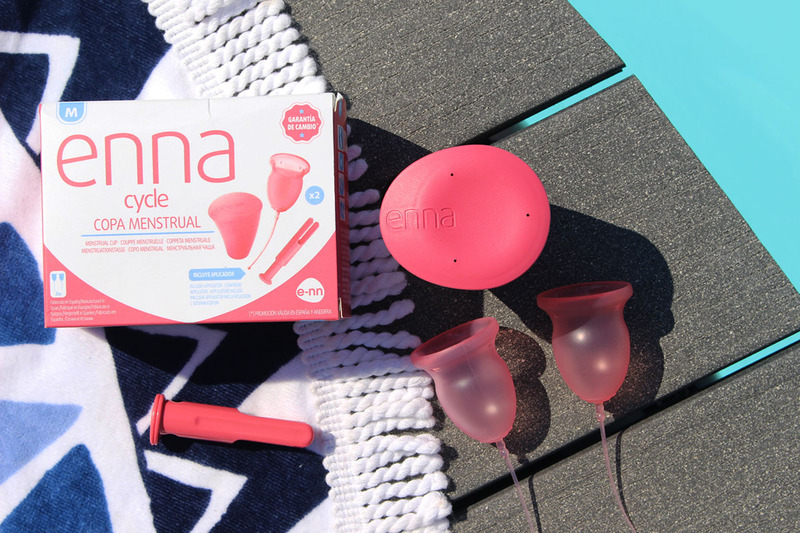 This is the Enna Cycle Menstrual Cup which comes with a handy applicator to help with insertion, which you might find tricky when you first start using it. It can hold up to 12 hours of fluid with no risk of leaks and it is made with medical grade silicone is not only biogedradable but will last for years and ensure your body`s PH is not altered. I have been using menstrual cups for quite a while now, as it's better for the environment and so much more convenient. You can buy the Enna Cycle here for £24.95. I was kindly sent a selection of products from beautymailbox.co.uk recently and these three made it into my travel bag. I am a huge fan of Healgel Firm Replenish & Smooth Face*(£42.00), as it helps to soothe and plump tired skin and give it a boost of hydration. Perfect for holidays! 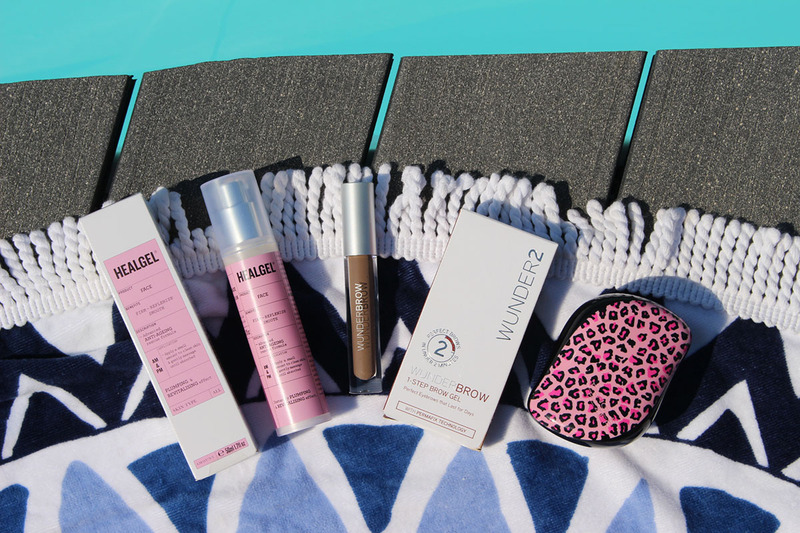 The Wunderbrow* is ideal for the pool, as it is waterproof and smudgeproof. Nothing worse than your eyebrows dissolving in the pool, haha. And it lasts on the skin for a few days. Last but not least, something I cannot live without - a travel Tangleteezer! Compact, incredible for tangled hair and the design is super cute too. I also packed some natural deodorants with me by Jason, Weleda and Salt Of The Earth which you can buy from Holland & Barrett. The first one smells a bot odd, but the other two are fab! That's it. My holiday essentials. I lived in a bikini/swimsuit with makeup free skin and loved every moment. Are you planning any getaways soon?